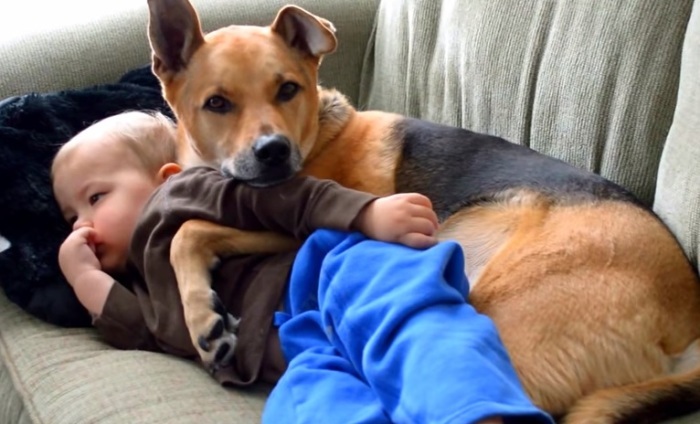 We often see videos of dogs comforting their owner, whether it be big or small. Dogs can be very comforting on any day. But what we see in this video is precious! This mother stood home with baby boy, Carter, because he was sick. After stepping out of the room for a minute, she comes back in to see the most adorable thing ever. She came back to her doggy cuddling next to her baby boy while he was watching TV. It's a priceless scene that you have to see happen. This adorable dog, Toby, has a heart of gold!